French Hobie® Championships: the suspense was maintained to the end. 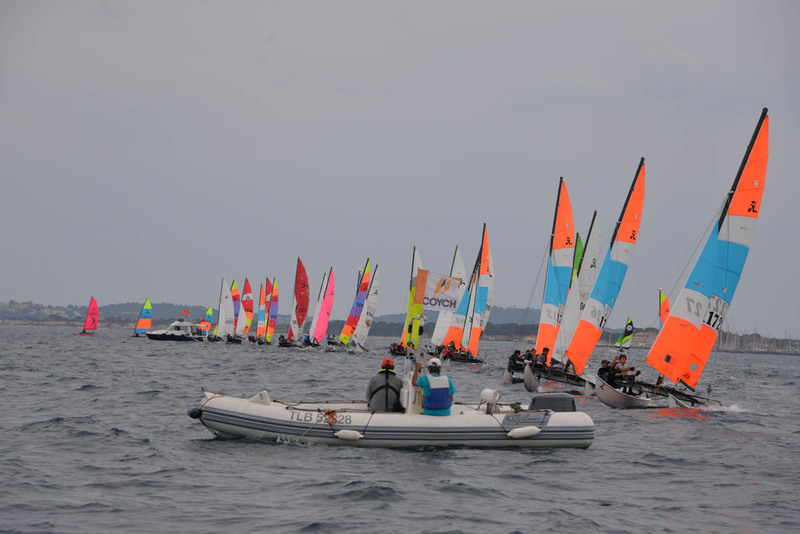 The French Hobie Cat Championships was organized by the COYCH in Hyères (Provence-Alpes-Côte-d’Azur) from the 19th to the 21st of May. 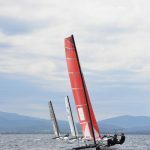 The 18th of May was dedicated to training, under a fresh breeze and good conditions. The traditional welcome aperitif was offered by the French Hobie Class Association. The first day was a bit complicated. There was not enough wind. Races were cancelled for HC16, HC14 and HC15, but Wild Cat and Tiger ran one. A welcome cocktail was offered by the host club to competitors. Gentle breeze allowed to run three races. Wild Cat and Tiger took the first departure, HC16 took the second, and HC15 and HC14 took the last one. HC16 : François De Cabarrus and Stoll Christian ; Frédérique Pfeiffer and Florence Lapaque ; Andy and Lisa Dinsdale. The general assembly of the AFHC took place in the evening, just before the traditional meal for crews. A rock band gave a concert for a non-stop dance party in a very friendly atmosphere! The last day was full of twists for HC16. 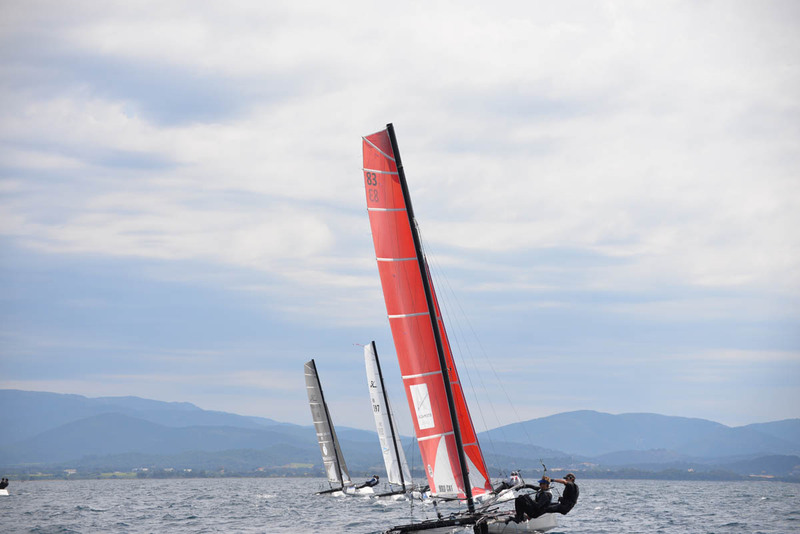 Four races were run under good conditions. A strong competition took place between Arnaud Thiémé and Flavie le Bayon, Cédric Bader and Mathieu Hars, Orion Martin and Charlotte Hilliard, Sylvain Chanteloup and Adélie Pomade. This led to reshuffle the cards of the HC16 final ranking! Doug Skidmore CEO Hobie Cat Company has honoured us with his presence during the event. He gave a wonderful rudder to the President of the COYCH, Jacques Espuna. In 2019, the French Hobie Championships will take place in the beautiful lake of Maubuisson (Nouvelle Aquitaine) and will be organized by the Cercle de la Voile de Bordeaux (CVBCM) from the 8th to the 10th of June The club has a long relationship story with Hobie Cat sailors. 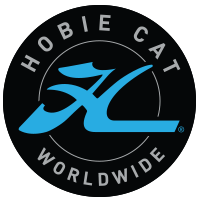 The CVBCM already organized Federals HC16 Classic Championship, and is partner of the Challenge Hobie Cat 2018. 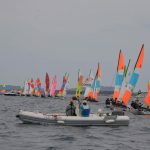 All European sailors are expected!